This is our 9th tutorial of Learning PIC microcontrollers using MPLAB and XC8. Till now, we have covered many basic tutorial like getting started with MPLABX, LED blinking with PIC, Timers in PIC, interfacing LCD, interfacing 7-segment etc. If you are an absolute beginner, then please visit the complete list of PIC tutorials here and start learning. In this tutorial, we will learn How to Use ADC with our PIC microcontroller PICF877A. Most of the Microcontroller projects will involve an ADC (Analog to Digital converter) in it, because it is one the most used ways to read data from the real world. Almost all the sensors like temperature sensor, flux sensor, pressure sensor, current sensors, voltage sensors, gyroscopes, accelerometers, distance sensor, and almost every known sensor or transducer produces an analog voltage of 0V to 5V based on the sensors reading. A temperature sensor for instance may give out 2.1V when the temperature is 25C and go upto 4.7 when the temperature is 60C. In order to know the temperature of the real world, the MCU has to just read the output voltage of this temperature sensor and relate it to the real world temperature. Hence ADC is an important work tool for MCU projects and lets learn how we can use it on our PIC16F877A. The program for using ADC with PIC Microcontroller is very simple, we just have to understand these four registers and then reading any analog voltage will be simple. As usual initialize the configuration bits and let’s start with the void main(). In this register we have to turn on the ADC module by making ADON=1 and turn on the A/D Conversion Clock by using the bits ADCS1 and ADCS0 bits, the rest will not be set for now. In our program the A/D conversion clock is selected as Fosc/16 you can try your own frequencies and see how the result changes. Complete details available on datasheet’s page 127. Hence ADCON0 will be initialised as follows. In this register we have to make A/D Result Format Select bit high by ADFM=1 and make ADCS2 =1 to select the Fosc/16 again. The other bits remain zero as we have planned to use the internal reference voltage. Complete details available on datasheet page 128. Hence ADCON1 will we set as follows. Now after initializing the ADC module inside our main function, lets get into the while loop and start reading the ADC values. To read an ADC value the following steps has to be followed. The void ADC_Initialize() function is be as follows. 2. Select the analog channel: Now we have to select which channel we are going to use to read the ADC value. Lets make a function for this, so that it will be easy for us to shift between each channel inside the while loop. The previous channel selection (if any) is cleared. This is done by using the bitwise and operator “&”. The bits 3, 4 and 5 are forced to be 0 while the others are left to be in their previous values. Then the desired channel is selected by left shifting the channel number thrice and setting the bits using the bitwise or operator “|”. 4. Wait for the Go/DONE bit to get low: The GO/DONE bit will stay high until the ADC conversion has been completed, hence we have to wait till this bit goes low again. This can be done by using a while loop. Note: Placing a semi-colon next to while will make the program to be held there till the condtion of the while loop is false. The complete function which is used to select the ADC channel, trigger the ADC and return the result is shown here. Now we have a function which will take the channel selection as input and return us the ADC value. Hence we can directly call this function inside our while loop, since we are reading the analog voltage from channel 4 in this tutorial, the function call will be as follows. i = (ADC_Read(4)); //store the result of adc in “i”. In order to visualize the output of our ADC we will be needing some sort of display modules like the LCD or the 7-segment. In this tutorial we are using a 7-segment display to verify the output. If you want to know how to use 7-segment with pic follow the tutorial here. Connections of 4-digit seven segment display module with PIC microcontroller are same as the previous project, we have just added a potentiometer to the pin 7 which is the analog channel 4. By varying the pot, a variable voltage will be sent to the MCU which will be read by the ADC module and displayed on the 7-segment display Module. Check the previous tutorial to learn more about 4-digit 7-segment display and its interfacing with PIC MCU. Here we have read the ADC value from the pot and converted it to the actual voltage by mapping the 0-1024 output as 0-5 volts (as shown in program). The value is then displayed on the 7-segment and verified using the multimeter. Thats it, now we are ready to use all the Analog Sensors available in the market, go ahead and try this and if you have any problems as usual use the comment section, we will be happy to help you out. Please reply me with by sending me the mail. To understand why I have shifted the bits thrice, you hav to look at the ADCON0 register in he datasheet. It will be shown at page 127 of the PIC16F877A datasheet. As you can see the CHS0,CHS1 and CHS2 are used to set the required channel for ADC. They are positioned after three bits from the right, hence in order to access them we left shift our values thrice and update the channel by using the or "|" operator. Please reply me why we use this Right Justification here. And please explain me the Right Justification & Left Justification. The operator "<<" is called Left Shifting operator. You have to google to know more about it. please from '' i = adc*0.488281; '' where is 0.488281 from? what calculation did you do that gave you that? and also please give me an example of the original value that will be stored in *adc* or the ADC_Read() function because i would love to know the original value of 'i' at each increment and decrements. Here, the variable adc will have the ADC value which was returned by the function ADC_Read(). This value will be 0 for 0V and 1024 for 5V. Now I have to display the voltage on a 7-segment display. 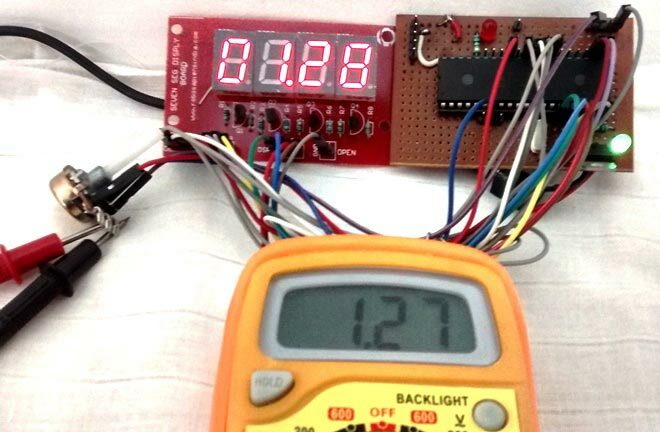 So the value stored in adc should be converted to actual voltage level that can displayed. hence I multiply the adc value with 0.488281 so that I could convert it into actual voltage. For Example: Lets say my Input voltage is 5V, the PIC will read it and store it as 1024 in my "adc" variable. When that is multiplied with 0.488281 it gives 499 (decimal neglected since "i" is an integer) now I can directly display this 499 on the 7-segment display just by adding a point before two digits. Generally the value "0.488281" is called as the multiplication factor and would vary based on your application. wow!! thanks a lot, you cleared my confusion.. Thanks for your relies so far... sorry from ADCON0 |= chennel<<3.. what if i wish to use other channel, like channel 3, 5, 6 and 7?? Remains the same for all ADC channels. Is used to read the data from the ADC channel 4. You can replace 4 with any preferred channel number. For example adc = (ADC_Read(6)); to read the ADC value from channel 6 and save it in the variable "adc". Please, use the forum to post your questions. So that everyone can be benifited out of it. s'il vous plait j'ai besoin d'aide pour l'ADC du 18f4431 . I'm new to coding and ran across your post but don't know how to apply to my project. See if you can shed some light. I am taking variable input range 85 to 45 VDC by using voltage divider. 1 - How much input Voltage I can take on AN0 (say 10V max or only 5v max)? 2 - What could be best formula to take 0.01V resolution to be used for PWM output for above input voltage? would be better if you reply by email as well. Good day. Honestly speaking, I have been kept silent for over three hours, reading your articles. Very explicit and unambiguous straight forward articles. I really appreciate your efforts and time you created for the whole explaination. may God Almighty Allah continue to increase your knowledge of understanding. Now my question is that, assume I want to configure two or more different input analog such as RA0(AN0), and RA1(AN1) to have independent input e.g sensor and other supply voltage to be displayed on LCD etc, how I am going to arrange the function . Please explain it to me the way you have cleared the article above. I am using PIC18F4685 and trying to understand ADC with this microcontroller (I just started a week ago with microcontroller). And I'm confused with the ADCON registers. How do I choose the ACQT bits? Can I set them to 000 or 0TAD as for now? I am using a Hall Effect Module as my analog input, a PIC18F4685, MPLAB XC8 as my compiler, PICkit3 as my programmer. I'm new to PIC programming, and I'm lost on how to set the ADCON registers for my PIC. I am using PIC18F4685 and it have ADCON0, 1 and 2. I have set my ADCON base on the PIC datasheet. At ADCON0, I have turned on the ADC and select channel0 (RA0). But what if I want to select other channels since my PIC have 8 analog channels. At ADCON1, reference voltage is the supplied voltage (bits 5 and 4). And the port conf bits are all analog input (bits 3 to 0). Bits 7 and 6 are unimplemented. At ADCON2, this part is where I am confused. Bit 7 is right justified and Bit 6 is unimplemented. Bits 5 to 3 is set to 101 or 12TAD, I have search to google and the minimum TAD for a 10bit ADC is 12TAD. How to know what TAD to choose? At the datasheet, A/D clock period minimum is at 0.7us and maximum is at 25us. Bits 2 to 0 is set to 101 or FOSC/16. Can I choose anything? I am using a crystal oscillator at 8MHz. Please do correct me if I'm wrong. I am still new to this and need some guidance.